Since Europeans first brought horses to South America over five centuries ago, horses have become an integral part of South American culture. From the legendary gauchos of Uruguay and southern Brazil to the estancia lifestyle of Chile’s Patagonian ranches and the world’s best polo players in Argentina, horse culture has a treasured place in the hearts of people in this part of the world. To really understand the countries of South America, you should get to know them through their horses. From seeking out wild steeds while on horseback to galloping along endless beaches, these are the best horseback-riding experiences in South America. 1. Saddle up the Estancia La Peninsula in Chile. In the 1800s, the wide open pampas in Chilean Patagonia became very popular for sheep farming, giving rise to the region’s baqueano cowboy culture in which poncho-wearing men with sun-darkened skin would ride around Western-style on horses, rounding up large herds of sheep. The lifestyle and traditions are still deeply entrenched in Patagonian culture, and one of the best places to get a glimpse of this lifestyle is at Estancia La Peninsula, a historic ranch located about half an hour from the frontier town of Puerto Natales. The horses that live there are of the Criollo breed descended from steeds brought by Spanish conquistadors, and they’re famous for their endurance and stamina. 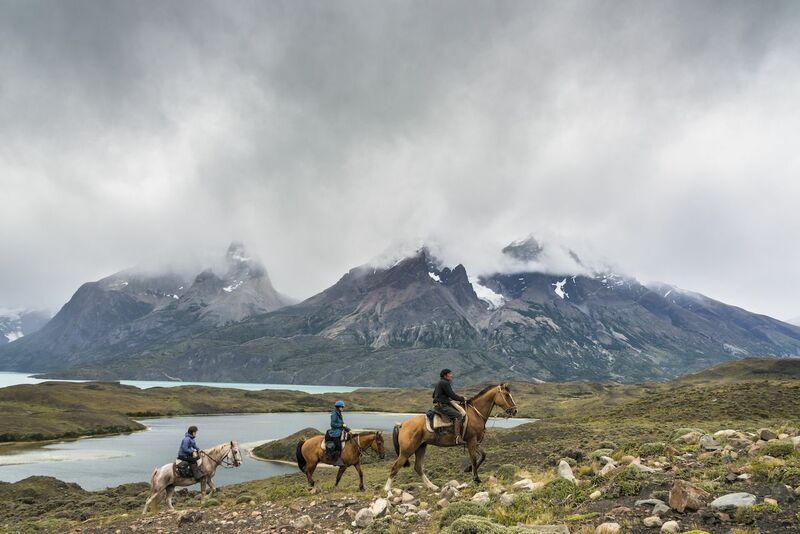 Multi-day horseback-riding trips take you through the mountains and pampas of Last Hope Sound, where you’ll take in incredible views of mountains, glaciers, lakes, and plains. A day trip, on the other hand, includes a horseback ride around the grounds, a sheep-shearing demonstration, and an authentic Patagonian barbecue. The horses used are gentle as they’ve been brought to La Peninsula for peaceful retirement after working on other estancias, or cattle ranches. 2. 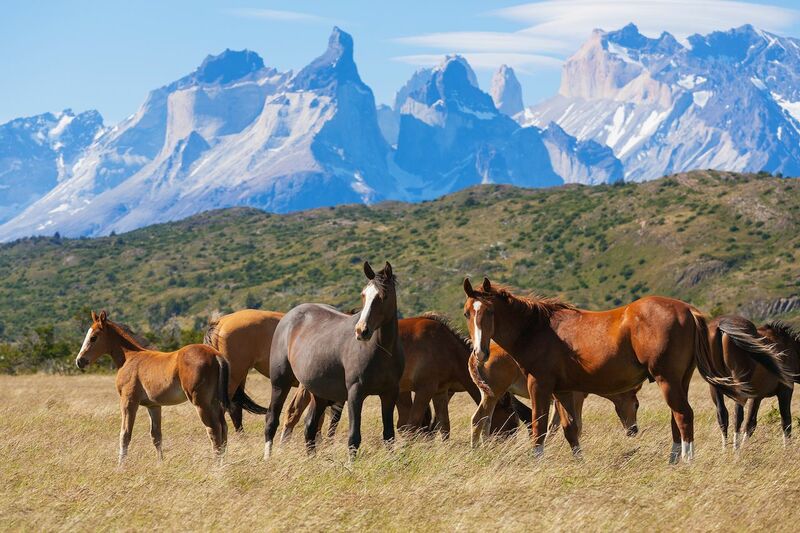 Go seeking the wild horses of Torres del Paine in Chile. These small herds are descendants of horses that escaped from Spanish explorers, and they still roam the backcountry around Torres del Paine National Park. They can be hard to find, but trackers in the area know what to look for and how to find them. Saddle up with a guide who will lead you through the back areas of the park, and you’ll see beautiful views of the Paine Massif, interesting flora and fauna, and, if you’re lucky, the wild horses themselves. 3. Learn to play polo in Argentina. Argentina doesn’t just produce legendary soccer stars like Diego Maradona and Lionel Messi. It’s also home to the best polo players in the world with nine of the world’s top 10 polo players hailing from Argentina. Although you could take in a polo match while sipping on an Aperol Spritz at any of Buenos Aires’s fine polo clubs, it’s best to get in the saddle and try it yourself. 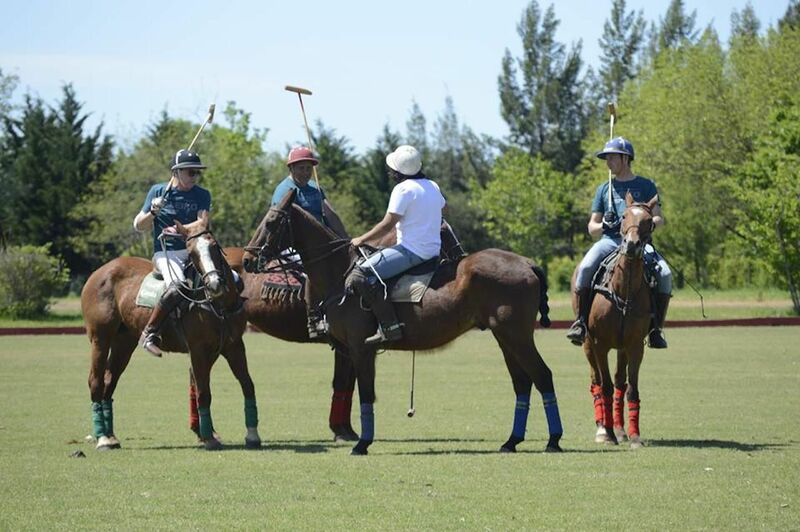 Through Argentina Polo Day, jointly offered throughout the year by two estancias outside the city, you can spend a day learning the art of polo. The program starts with a lecture about the history of polo and explanations about the rules, equipment, and horses. After watching a quick game to see all in action and getting acquainted with your assigned horse, the instructor gives you a polo lesson followed by a mini-match, during which you and other novices get to play together. 4. Visit the Estancia Los Potreros in Argentina. After getting to know the high-society pomp of playing polo, it’s time to head out to the countryside to experience the other lifestyle in Argentina that revolves around horses: being a gaucho, or cowboy, and living on a traditional estancia. The ranches in southern Patagonia are more famous, but in the beautiful north and central regions of Argentina, they’re just as prolific and culturally influential. In Cordoba, Los Potreros Estancia is a stately working ranch that keeps sheep and cattle where guests can work alongside the gauchos on tasks like rounding up cattle, partaking in gaucho horse games and races, or just going for rides out in the beautiful countryside. Los Potreros has a herd of more than 130 well-trained and impeccably bred horses, including criollos and Peruvian Pasos, which are famous for their smooth, rhythmic gait. The countryside around the estancia is lush with sweeping plains, valleys, and rivers, and you feel like a genuine cowboy while out there riding on these well-mannered and award-winning horses. 5. Live the gaucho life at the Panagea Estancia in Uruguay. Many of the estancias throughout South America are very elegant, built and operated as they were by wealthy landowners. To stay viable today, many now cater to moneyed tourists with upscale stays and day trips. And while these estates are lovely, they’re also expensive. For a taste of the real nitty, gritty estancia life, the Panagea Estancia backpacker hostel and working ranch in northern Uruguay is the place to go. There’s no lounging on the veranda here. You work and experience real gaucho life, living on your horse all day, receiving three simple meals, and bunking down dorm-style in basic but cozy accommodations. You’re invited to participate in all the workings of the ranch, trying out standard farm chores like feeding and grooming, learning how to properly herd cattle, and learning how to horseback ride properly. 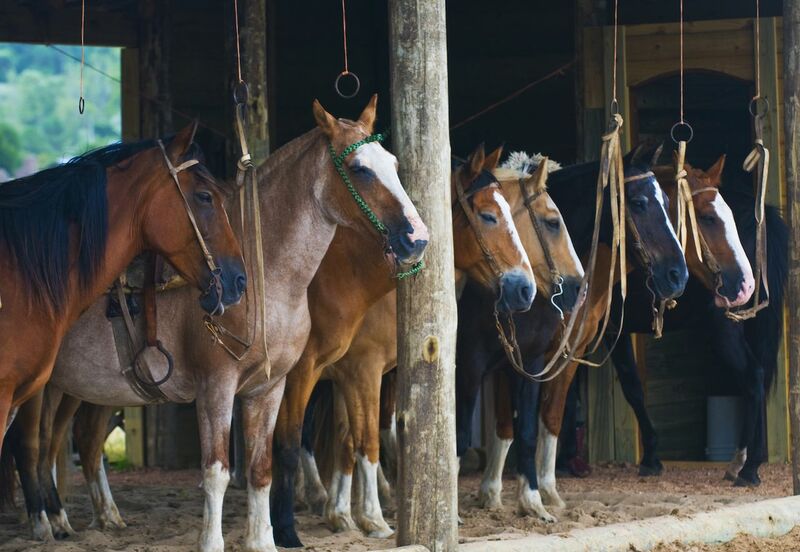 The estancia promises that you’ll be working on horseback every day with its herd of working horses. And when you get to go out on rides, the views are enchanting: The waving grassy plains of the Uruguayan pampas stretches off to the horizon. 6. 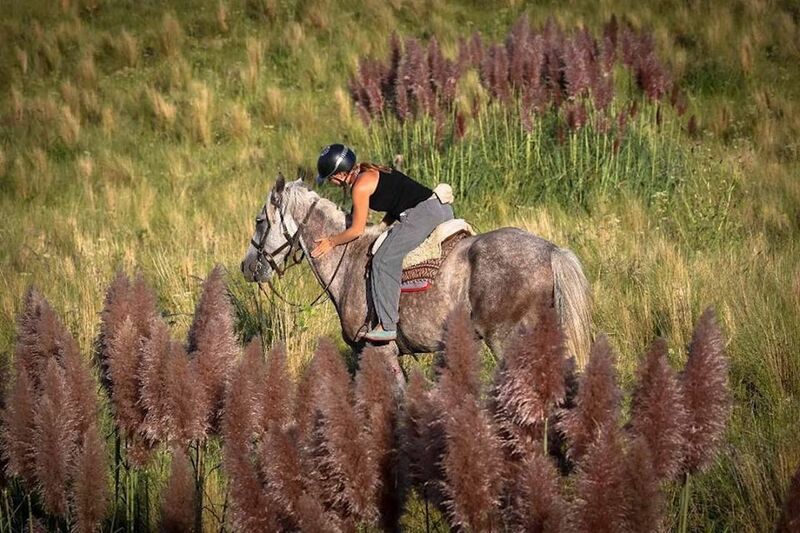 Ride along the Atlantic Coast in Uruguay. 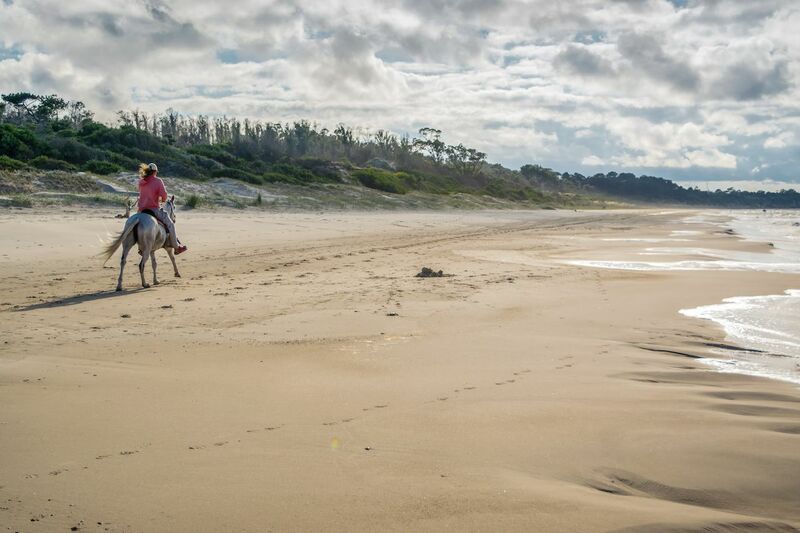 The coast of Uruguay is a virtually unbroken stretch of sun and sand — perfect for a day of cantering. A great place to start is at Punta Diablo, a small fishing town that has lovely curving beaches and fine weather. From there, you can horseback ride along the beach down to the town of Cabo Polonia and its accompanying national park, which has gorgeous ocean views and sand dunes to ride through. You’ll likely see marine life like sea lions, frogs, many different kinds of birds, and, if you’re lucky, migrating southern right whales. Various tour companies in the area can do day trips. Another option offered by Ride World Wide, a tour operator dedicated to only horseback-oriented trips, is a tour that includes several days of riding down the beaches mentioned above, ending in the town of Castillo further down the coast from Cabo Polonia. If galloping on a horse along a sandy beach with the salty wind in your hair and the sun on your face is your idea of paradise, pay a visit to the Uruguayan coast. And since Uruguay gets fewer tourists than some other South American destinations, a peaceful experience without a huge crowd is a given. 7. Go riding through the Pantanal in Brazil. Horses and the culture around them are a big deal in Brazil. The country has a storied and honored cowboy culture, and Brazilian horses — like the country’s national horse, the Mangalarga — are renowned for their breeding. 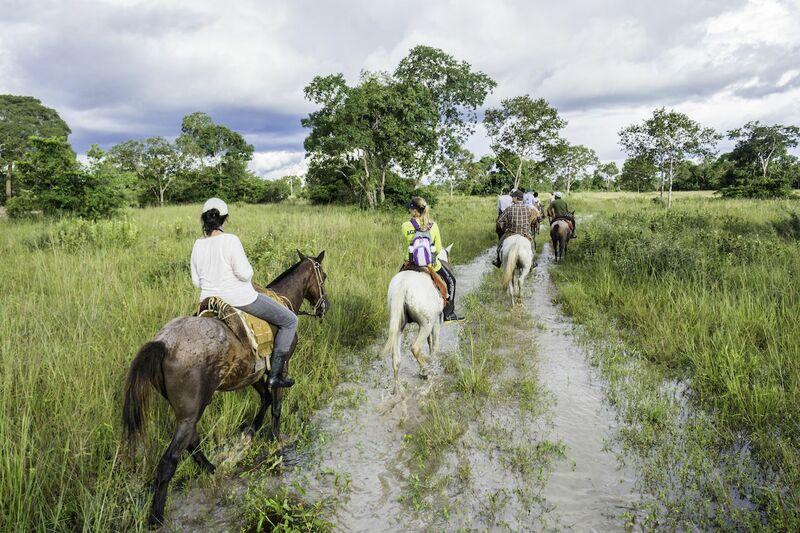 Among the many horse-related activities you can do in Brazil is riding through the gorgeous Pantanal. The Pantanal, located in the state of Mato Grosso do Sul, is the world’s largest tropical wetland, with rivers, estuaries, marshes, and grassy lands stretching off in all directions. It’s a great place to see native wildlife like tapirs, capybara, and, if you’re really lucky, jaguars. Exploring the area on horseback is a fantastic way to take in the scenery and keep an eye out for interesting animals. Gaucho do Brasil is one of the companies that offer horseback riding tours in the Pantanal and elsewhere in Brazil.